The Tampa Bay Times continues to run with the light-rail solution. It did not take long for the big rail supporters to get a significant boost from the Tampa Bay Times. 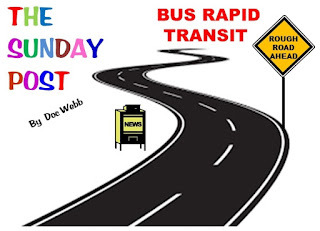 Here are a couple of editorials taking the recent Jacobs Engineering recommendations for Bus Rapid Transit (BRT) to task. The Times has been a staunch light rail and transportation-oriented redevelopment supporter for years. The developers and real estate people have been salivating over light rail and the prospect of ripping up significant portions of the Pasco, Hillsborough and Pinellas counties to build an expensive light-rail system and terminals. The “redevelopment” comes from retail and residential centers they hope will develop around rail stations and the expected property value boom and associated construction. The chairman of the Pinellas Suncoast Transit Authority, Pinellas County Commissioner Janet Long, summed it up right this month when she told the Tampa Bay Times editorial board she was disappointed in the shift from rail. "I think we need to keep all the options on the table," she said, "while we figure out what the needs are." What Janet Long needs is a reality check. A lot, more money will float around if light rail comes to the area, and big beneficiaries will be the developers and real-estate people who the politicians let get their fingers in the pie on the front end and back end. BRT is not a “compromise" as the light-rail supporters would have you believe, it is a realistic approach to the regional transportation problem. And let’s look at the flip side. There is no guarantee that any large-scale public transportation solution will work or be financially viable. In fact, most are not. In good economic times when employment rates are low, and almost any new car dealer in the area can put you in a car for “0 down, 0 security deposit and no first month’s payment” regardless of your credit; cars will still be the first choice. One only needs to look at current HART and PSTA year over year rider ship statistics to understand. It would seem to me rather than rip the counties apart by cutting a swath to plant light rail, spending untold billions of dollars to buy land, lay rails and build stations a BRT solution that can flex and grow at a fraction of the cost makes a lot more sense. It is time for the light-rail touters to step from the train into the light and come to grip with the fact that large-scale light rail is not going to happen. And that’s a good thing for the region.